Here is the cake, spread with cheese and adorned with fresh plum slices ready for the oven. OK, so ours lacks the magical dusting of powdered sugar, fresh plums, and purple granite(?) countertop (not to mention, a professional photographer taking the picture). However, it was pretty delicious! Squire's teacher deemed his creation, "Bona fide." 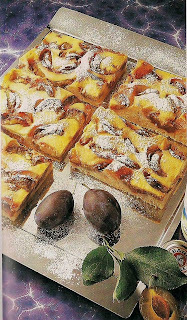 He said he'd had pastries that had tasted just the same in Germany - minus the plums. (Perhaps the plums are an Austrian thing?) In any respect, it was an interesting process and enjoyable to try something quite different from what we would normally bake/eat. Top each slice of bread with the mayo mixture, turkey, some diced tomatoes, an avocado slice or two, some more mayo mixture, some of the grated cheese, and a couple sliced olives from the 2 TBL. mixture (as garnish). Bake @ 350*F for about 15 min. or until heated through. Enjoy! Mix together flour, crumbled yeast, lukewarm milk, egg, sugar, salt, vanilla extract and softened butter in a large bowl to form a soft dough. Let rise in a warm place for about 20min. Topping: Beat sugar, egg yolks and grated lemon rind until foamy. Add cornstarch and cream. Drain cottage cheese (Squire drained and squeezed the cottage cheese through a piece of cheese cloth, over a sieve), pass through a sieve, add to egg batter and continue beating until batter is smooth and creamy. Beat egg whites until stiff and fold gently into egg mixture. Wash plums, cut in half and remove pits. (Squire cut these up in to smaller slices as well.) Grease baking sheet and spread dough evenly. Dust with ground almonds and prick in several places with a fork. Spread cottage cheese mixture over the top. Press plum halves, skin down, gently into the batter. Arrange bread cubes in lightly greased baking dish. Sprinkle chopped ham over the bread. Beat eggs, milk, salt, mustard, pepper, and cheese in a bowl. Pour egg mix over the bread. Cover with foil/plastic wrap and chill overnight. Bake at 350 degrees for 45-60 minutes, or until eggs are set. Pull out of oven and let sit for a few minutes before cutting.